Powers/Abilities: Scintilla can shrink to as little as 1/20 of her normal size and has used a Shi'ar anti-gravity device to fly. Scintilla can also restore others to their natural height by focusing her powers through an amplifying device. She can increase her weight to its natural state while still in miniature size. It is unknown if her abilities are possessed by her entire race or solely by her. The full extent of her abilities are likely unknown. (X-Men I#107) - Members of the Imperial Guard fought the X-Men (Banshee, Colossus, Cyclops, Nightcrawler, Phoenix (Jean Grey), Storm, Wolverine) and Starjammers (Ch'od, Corsair, Cr+eee, Hepzibah, Raza) at the M’kraan Crystal, in order to stop them from rescuing Lilandra from D’ken and Davan Shakari. When the X-Men arrived, Astra demanded to know who they were. After a fierce battle, during which Wolverine startled Astra by wearing Fang’s costume, D’ken was rendered comatose and Lilandra took over as the new Majestrix. Members of the Guard in this mission: Astra, Electron, Fang, Gladiator, Hobgoblin, Impulse, Magic, Mentor, Midget, Nightside, Oracle, Quasar, Smasher, Starbolt, Tempest, and Titan. (X-Men: Spotlight on Starjammers#2) - At Deathbird’s orders, a large group of the Guard attacked the Starjammers and Excalibur (Captain Britain (Brian Braddock), Lockheed, Meggan, Nightcrawler, Shadowcat, Phoenix (Rachel Summers), Widget) on Earth, but they retreated when Deathbird was put at risk. Guard members who participated in this assault: Astra, Black Light, Blackthorn, Earthquake, Electron, Gladiator, Hobgoblin, Impulse, Magik, Mentor, Midget, Nightside, Oracle, Smasher, Starbolt, Tempest, Titan, and White Noise. (Avengers West Coast#81) - Scintilla and Nightside (who was put in charge of the mission much to Scintilla’s chagrin) infiltrated Project: PEGASUS to liberate the captives Warstar, Hobgoblin, and Shi’ar soldiers. Scintilla restored the captives to their natural sizes (as they’d been held in miniature state) by focusing her power through an amplifying device. 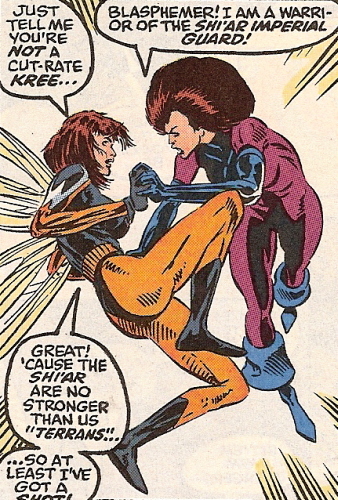 Scintilla defeated the Wasp when the Avengers (Dr. Pym, Falcon, Gilgamesh, Mockingbird, She-Hulk, Spider-Woman (Julia Carpenter), USAgent, Wasp) attacked by increasing her weight and landing on Wasp, then shrank down and hid on Hobgoblin’s form. Hobgoblin disguised himself as Minerva of the Kree and convinced Atlas to return with them to the Guard ship, where Starbolt and Neutron waited. Hobgoblin revealed himself and stole Atlas’ Nega-Bands, then fled back to Shi’ar space with Scintilla while Starbolt and Neutron battled Quasar (Wendell Vaughn) and Her. (Starjammers I#4) - Members of the Guard were summoned to aid Lilandra against the Uncreated, but the Starjammers saw the threat defeated first. They stood by when Lilandra ordered T’cahr arrested. Members of the Guard in this mission included: Electron, Fang, Flashfire, Gladiator, Nightside, Oracle, Scintilla, Smasher, Starbolt, and Titan. (Uncanny X-Men#480) - The Guard finally defeated Vulcan (keeping him alive at the orders of K’tor) after a deadly battle which left some Guard members, including Cosmo, Impulse, Smasher, and Titan, seemingly slain. Scintilla was furious about Vulcan being allowed to live. Guard members in this mission: Astra, Cosmo, Electron, Gladiator, Hobgoblin, Impulse, Manta, Mentor, Neutron, Nightside, Oracle, Plutonia, Scintilla, Smasher, Starbolt, and Titan. (X-Men: Emperor Vulcan#3) - The Imperial Guard (Gladiator, Manta, Nightside, Oracle, Scintilla, Starbolt, Titan, Warstar) greeted the Starjammers, who agreed to an alliance against the Scy'ar Tal. Soon, Araki entered with his private guard, the Shi'ar Death Commandos (Blackcloak, Colony, Devo, Flaw, Hypernova, Krait, Offset, Sega, Shell, Warshot). Marvel Girl grew furious and lashed out in a powerful attack, sending the Commandos scattering and threatening Araki's life, even accusing him of running the secret order of the Shi'ar and ordering the death of her family, until Polaris stopped her. (X-Men: Emperor Vulcan#5) - The Imperial Guard (Electron, Flashfire, Gladiator, Manta, Mentor, Nightside, Oracle, Plutonia, Scintilla, Titan, Warstar) stood by Deathbird, Araki, and Ka'ardum as the Shi'ar cheered on Vulcan. The Starjammers (Ch'od, Havok, Polaris, Raza) lay captive. (War of Kings#1) - Vulcan surveyed, with Gladiator, the assembled Imperial Guard,. Mentor reported they were all battle ready and Vulcan announced his intentions to attack the Kree. They soon engaged in a massive battle with the Inhumans and Starjammers, successfully capturing Lilandra before retreating. Members of the Guard in this mission: Astra, Black Light, Earthquake, Electron, Fang, Flashfire, Gladiator, Hussar, Impulse, Magique, Manta, Mentor, Neutron, Nightside, Plutonia, Schism, Scintilla, Shapeshifter, Smasher, Squorm, Starbolt, Titan, Voyager, Warstar, and White Noise. (Guardians of the Galaxy II#15) - The Imperial Guard (Fang, Hussar, Magique, Mentor, Oracle, Scintilla, Voyager) landed on Knowhere, where the Inhumans and Guardians of the Galaxy, with Cosmo, were already battling. Mentor ordered the Guard to kill Black Bolt, but Black Bolt knocked them back with a small scream and the Inhumans teleported off-site through Lockjaw. Mentor ordered the Guard, with their Shi'ar operatives, to separate and find Warlock and the others, knowing Voyager's needed time to recuperate before seizing reinforcements. After a pitched battle, in which Magique was killed, the Guard fled. Midget/Scintilla has a partial entry in OHotMU Deluxe Edition#6. 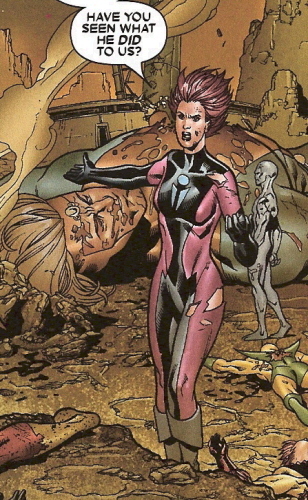 The Imperial Guard was a takeoff of DC's Legion of Super-Heroes, making Scintilla a takeoff of Shrinking Violet.